Voodoo Cap | BUDK.com - Knives & Swords At The Lowest Prices! very nice good looking caps. Well worth the money. The cap fits nicely and can be adjusted easily. I have a big head and this hat fits with plenty of room to spare on the adjustment! Looks good also! I ordered 5 of these hats. All different colors , and all had embroidered flags. No Velcro. I was a little disappointed to see Made in China,( that's the only reason I gave a 4 rating), but, they'll work. Really nice good looking caps. Well worth the money. I also ended up with a velcro patch. I'm going to remove the velcro and sew the patch directly to the cap. Aside from that, I love it. Fits well. I'm ordering another in a different color. Totally worth it. I really like this hat, the picture shows a embroidered American flag. We received a Velcro patch attached to a hat. Hat fit great but looks funny with the patch attached. The patch is raised up about 1/4 inch and the patch looks bad compared to the picture! I would even order it again if it was embroidered because it fits great the patch just sticks out to far. A previous reviewer said his flag was velcro'd on/removable. I got an olive drab cap in May 2015 and my flag was professionally embroidered on. It IS NOT removable. Looks very good. Cap fits my head just OK. I've got a small size 7 head. I like a ball cap that actually touches my head all around and doesn't stick up at the top. This one sticks up at the top a bit. I think if you have a normal size head, this would conform to it a little tighter. Finally a cap that fits right!!! Its always a crap game when it comes to buying a cap online, either it sits so high that I look like I have a fivehead instead of a forehead or I have to pull it down so low that it smashes my ears out to the side. This cap fits perfect, it sits right on top of my head giving a low profile without smashing my ears down and the brim is pre-shaped with the perfect curve. One thing the picture doesn't show well is that the Flag is actually a removable patch so it doesn't look as flush as the pics but I personally like the removable patch. Liked it so much I want to get a couple more in the other colors. Thanks BudK!!! 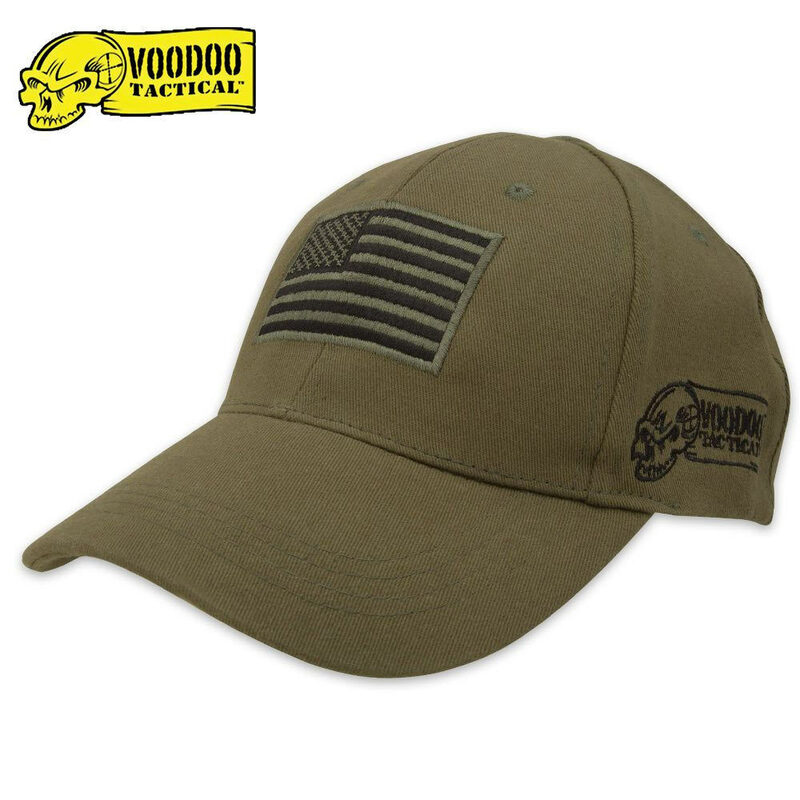 Very nice hat and comfortable to wear, solid construction with adjustable strap and lets not forget it is from voodoo. Yeah, That's what I'm talking about. BUDK does it again. This is just what I was looking for. Definitely worth the wait for back order ! It appears that these are selling so well, that they are hard to keep in stock ! And I can see why; this Professional Military Contractors Cover is really comfortable, and the olive drab color is just right. Last, but not least; it was shipped in the right size box, so the crown would not be crushed ! BUDK has got my six!!!!!!!!! !